“I call you ŋäṉḏi, you call me waku. I am your daughter.” That was the moment when I stepped into the intricately beautiful kinship system of the Yolŋu people of North East Arnhem Land. Eight years on and I am filled with awe at the wonderfully accepting and loving nature of the relationships I have gained since my adoption into this culture. Galiwin’ku Aboriginal community is located on Elcho Island in the remote north-eastern corner of the Northern Territory. I live here, working for one of TEAR’s partners, the Arnhem Human Enterprise Development (AHED) Project, in social and economic enterprise development. Life is different here. 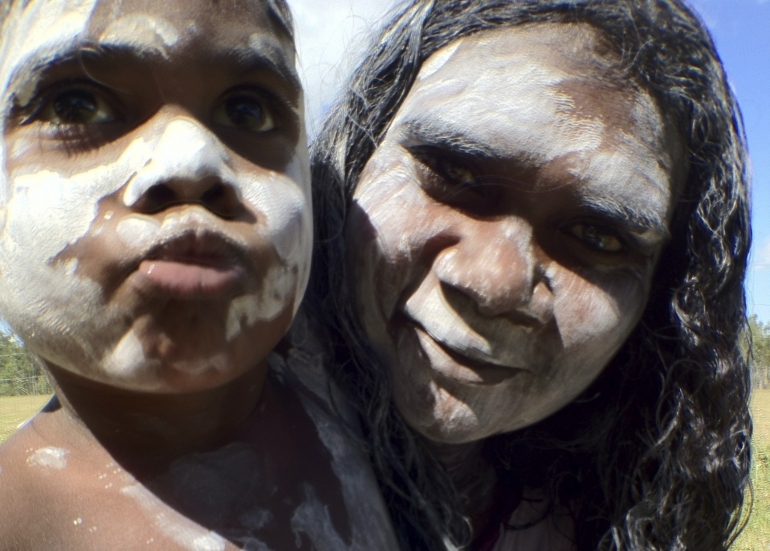 On the surface the community is managed by mainstream Australian bureaucratic systems and policy, but underneath traditional Yolŋu culture and law run deep and strong. English is a fifth or sixth language for most people. Ŋäṉḏi is the Yolŋu word for mother and I hear it spoken with great affection every day. The deep love within the word rises in defiance of the oppression and poverty that is reality for every man, woman and child here. In the Yolŋu kinship system a child will call their mother ŋäṉḏi and all their mother’s sisters ŋäṉḏi, so everyone has multiple mothers. Equally, every woman has multiple children or waku, some are her biological children and some are not, but her responsibility to care for them is the same regardless. The system produces a wonderfully organic support network for mums – nobody ever does mothering on their own. My eldest Yolŋu daughter is a worker outside of the home. She enjoys it and her income supports her extended family. Because she works, it is the responsibility of her sisters to care for her younger children. What I have found most lovely about this natural arrangement is that often the sister or ŋäṉḏi with the most nurturing personality takes on the caring role with the children. They play life to their strengths and it works out happily for the whole community. My love of this term ŋäṉḏi really peaks when I meditate on it in the context of Yothu Yindi. The phrase, made famous by the rock band, is a special Yolŋu concept pertaining to every aspect of life. Yothu means baby and yindi means big, but when spoken together the words express a deeply significant connection between two things. The connection can be between two people, between a person and land, between two places, between two clans, between any two entities or things. It is a connection that is characterised by a mother-child relationship. In any pair there is a yothu, the child figure, and a yindi, the mother figure. Every person has a yindi, every place has a yindi, every group has a yindi, and every animal has a yindi. Equally each of those entities has a yothu. This means that everything is cared for. No one is overlooked. Everything, every place and everyone has someone watching their back, looking out for them, nurturing them. This is how the Yolŋu world works and it is how they preserve social harmony, peace and calm. Everybody partakes in the responsibility of being a yindi and the responsibility of being a yothu. So, in a ŋäṉḏi-waku (mother-child) relationship, ŋäṉḏi is the yindi and she understands this role in the most intimate way. Not only does she learn how to be a mother from her own experience as a daughter, she learns it through every element of her own cultural worldview. Ŋäṉḏi has seen the power of her yindi clan caring for their yothu land estates and environment, she has experienced the stability and assurance of her yindi clan caring for their yothu clan, she has seen how this concept sustains the essence of her society and she partakes in it and reflects it upon her waku mala (children). What a contrast this is to my own experience of motherhood in mainstream Western culture, where our sense of community is somewhat less intimate or far-reaching. We put our children into childcare centres run by strangers because we don’t have the community and support networks we need to do anything else. Since the birth of my own daughter a year ago, I have reflected a lot on my new role as her mum. Coming out of our Western worldview it was almost by default that my husband and I tried to do parenting all on our own. We tried to be independent as a family unit, relying on no one. But human beings have been made to live in community, to be interdependent on one another. Thankfully, in observing the culture and worldview of the community that I am here trying to help “develop”, I have found my own hope for tomorrow as a mum. The hope that I can find and live in that beautiful, loving, Yothu Yindi community that I have been created for. TEAR Australia is a major funding partner of the AHED Project. Thanks so much for sharing something of what I also saw in an Arnhem community. Your succinct and deeply moving description of family/mothering in Yolgnu culture illuminates the contrasting and often painful journey of mothering in our ‘developed’ culture, especially for single parents. Sharing the richness of your experience in the NT may open many Western eyes to our own inadequacies and shortcomings and inspire more of us to create our own supportive communities. We have so much to LEARN from our Indigenous people.